from the seminar presented at the Kamalashila Institute for Buddhist Studies in Langenfeld, October 2006. Note : In order to practice chöd, the sincere disciple must have received transmission and permission from an authentic lineage-holder. The transmission is a spiritual blessing that is passed down in an unbroken lineage, and as such protects the student on this quite advanced path of practice. I am very happy to have the opportunity to speak about chöd and hope that my introduction will be helpful for all of you who wish to engage in the practice. It is important to know which tradition of teachings chöd belongs to before one begins. gChöd belongs to the Secret Mantrayana (gsang-sngags being the Tibetan term that is synonymous with Vajrayana) and was brought to Tibet from India within the scope of the Eight Chariots of Accomplishment by Machig Labdron. Ma-gchig Lab-sGron , ‘One Mother, Lamp of the Lab’ was born in the region of Lab in Central Tibet and lived from 1055-1152 A.D. It is important to know that Machig Labdron did not invent chöd, a practice that brings together the essence of the entire teachings on Prajnaparamita that Lord Buddha presented when he turned the Wheel of Dharma a second time in Rajgriha, India. Prajnaparamita is shes-rab-kyi-pha-rol-tu-phyin-pa in Tibetan and means, ‘reaching the other shore through the perfection of wisdom-awareness,’ in the sense of having left “this shore” of dualistic concepts. Prajnaparamita embraces the complete Mahayana teachings of perfect omniscience - the heart of Lord Buddha's realization. The Buddha gave short, middle-length, and long instructions on Prajnaparamita on the occasion of the Second Dharmachakra and meticulously explained insight into emptiness. Prajnaparamitasutras are the scriptures that were later composed in India (between approximately 100 B.C. and A.D. 600). The short text consists of 700 lines, the middle text has 8000 verses, and the long text has 100,000 verses. Chöd combines the Prajnaparamita teachings with the practice of lojong (blo-sbyong, ‘mind training’). Lojong is the Mahayana meditation system of the early Kadampa School on purifying the mind through self-cultivation and intellectual discipline. Dipamkara Srijana Atisha, the founder of the Kadampa Tradition, originally received this as a transmission from his supreme master Dharmakirti. Atisha brought this great transmission lineage to Tibet and compiled all teachings into his major work, entitled The Seven Points of Mind Training. These teachings have been assimilated by all the Tibetan Buddhist schools. Chöd means ‘cutting through,’ i.e., severing erroneous concepts about the world of appearances and all illusions regarding the existence of a self. The practice of chöd is an advanced skilful method that enables practitioners to become free of clinging to false notions and beliefs regarding inherent existence of appearances and experiences and therefore of an individual self. Attachment and clinging to a self are forces that give rise to the defilements, which are the source of anguish and pain. Chöd is the practice that enables disciples to understand emptiness of all appearances that are fit to arise and therefore can be apprehended. It is an exceptional practice. One needs to eradicate unfavourable delusions and hindrances and accomplish favourable conditions in order to realize and manifest perfect awakening. Unfavourable conditions are all negative habits that conceal the pure vision of reality. There are three types of unfavourable conditions: (1) delusions caused by past evil deeds, (2) delusions that are present and manifest as disturbing and therefore harmful emotions, and (3) the delusion of not knowing the true nature of all things. These delusions need to be purified. Furthermore, a disciple needs to accumulate favourable conditions, accomplished by practicing the six paramitas. Generally, the six paramitas that a bodhisattva practices in order to achieve the highest goal of awakening are: generosity, ethical conduct, patience, joyful endeavour, meditation, and wisdom-awareness. The first paramita (‘perfection’) is transcendent giving that dissipates scarcity and wants that beings living in poverty endure. There are three ways to be generous: general, exceptional, and very difficult generosity. (1) General generosity is giving clothes, food, medicine, and other everyday necessities to those who are destitute. (2) Exceptional generosity is additionally giving away precious things that one cherishes very highly to those in need. (3) Extremely difficult generosity is even giving away one’s own body. We know from stories about the former lives of Buddha Shakyamuni, at times when he was a bodhisattva, that he gave away his body or head, which is a very difficult thing to do. Can an ordinary individual do this? Shantideva taught in the Bodhicharyavatara that it is not at all recommendable for someone who has not realized extraordinary wisdom and compassion to give away his or her hands or other bodily parts. We may conclude that it is therefore impossible for ordinary beings like us to be just as generous as the Buddha was in his former lives. But the aspiration to achieve this most difficult kind of generosity is not less beneficial than actually carrying out the act. Therefore, so that doubts and discouragement do not arise, one practices phowa ('pho-ba being the practice of transference of consciousness). One imagines that one transfers one’s consciousness outside the body and then offers hands and limbs to ghosts, ghouls, evil phantoms, and gods. What is exceptional about giving away one’s own body? Why is it really helpful? The size of the offering and the intention are decisive. If both are great, then the benefit will be great. What does this have to do with one’s physical body? Nobody will deny that one cherishes and clings to one’s body the most, therefore giving it away is an exceptional present. Why did Shantideva say that such an act is impossible for ordinary beings? He wrote that it is not such a good thing to do because ordinary beings are overly attached and habituated to their body. He explained that one may be fascinated by the idea, but when it comes to actually living up to one’s intention of giving away one’s body or limbs, one loses heart and becomes more than distraught. As a result, regret overwhelms practitioners. When this happens, one discovers that the intention was not such a good idea after all. And so, generously surrendering one’s body while practicing chöd is only imagined, which is already very beneficial. Merely imagining such an act of generosity is therefore a precautionary measure so that there is no danger of regretting and feeling badly when the situation actually presents itself and one backs off. The instructions dealing with the sixth paramita say that prajna (‘wisdom-awareness’) needs to be realized in order to achieve supreme awakening. Wisdom-awareness is the realization that all appearances in the world and one’s life are devoid of inherent existence, i.e., everything is empty of a self-existing nature. The Prajnaparamitasutra states: “There is no form, no sound, no smell, no taste, no touch, no mental formation, and so forth.” It is necessary to relinquish all preconceptions and discursiveness that one clings to and nurtures in order to fully realize the empty nature of all things referred to in the above verse. Chöd is a reliable and powerful method of practice to overcome all false assumptions about the world of appearances and experiences. Imagining that one is offering one’s body as food to spirits and demons helps a practitioner give up clinging to a self, which, in truth, does not exist as supposed. It is so much easier imagining that one is offering one’s body to those one loves and admires. Offering one’s body to those one fears and dislikes, to those deemed enemies and foes, to those who hinder and obstruct any plans one may wish to accomplish is much more difficult. Therefore, the instructions on chöd suggest that, in order to overcome and reliably dispel attachment to a self, one specifically imagines giving one’s body to those one dislikes the most as well as to those who have been helpful and kind in the past. Nyama Paldabum, one of Jetsun Milarepa’s very close disciples, approached him and asked, “You have received good instructions. But when one has received instructions, one needs to go into the mountains to practice. What kind of Dharma practice have you done?” In reply, Milarepa sang of outer, inner, and secret chöd, in which one cuts through one’s attachment to the self more efficiently each time. He sang, “External chöd is to wander in fearful places where there are deities and demons. Internal chöd is to offer one’s own body as food to the deities and demons. Ultimate chöd is to realize the true nature of the mind and cut through the fine strand of hair of subtle ignorance. I am the yogi who has these three kinds of chöd practice.” The instructions that Milarepa offered Nyama Paldabum are recounted in the 100,000Songs of Milarepa. Jetsun Milarepa taught that chöd is entwined with the syllable PHET, the Sanskrit metaphor for ‘cutting through.’ Machig Labdron did not translate the mantra into Tibetan, because it embodies the essence of all teachings. Jetsun Milarepa went into great detail and explained that there are three ways to cut through clinging to a self. The practice of outer PHET enables a practitioner to gather and bind the mind, allowing him or her to hold the mind steadily and stop it from going astray. Inner PETH allows a practitioner to dispel delusions and drowsiness. And secret PHET enables a sincere practitioner to fathom the depths of everything that can be apprehended so that most subtle levels of clinging to a self are cut. Many thoughts of hatred, lust, pride, jealousy, etc. arise in the mind, sometimes so overwhelmingly strong that it is impossible to hold or focus one’s mind during meditation, becoming lost in distractions instead. Anger, for instance, arises very often and is usually directed towards someone who threatens one’s physical existence. When situations like this occur, imagining that one is giving one’s own body to those who are angry and threaten one’s life severs attachment to a self. Then the mind is collected. Therefore, outer PHET is the practice of maintaining a steady mind so that thoughts do not carry one away. Inner PHET serves to dispel dull states of mind. Heavy and wild thoughts distract more obviously than subtle thoughts, but drowsiness and dullness also lead astray. Mental dullness, even unconsciousness (which are based upon attachment to a truly existing self that purports to possess a truly existing body) can reliably be overcome through the practice of chöd. So the inner mantra is the practice of eradicating mental dullness. Secret or true PHET is the practice that opens the door to realization of mind’s true nature through wisdom-awareness. It is not utterly hard or impossible to learn that all outer and inner appearances lack inherent existence, i.e., are empty of a self-entity. It is easy to logically deduce that forms, sounds, etc. lack independent existence, are mere appearances that arise in dependence upon other things and are therefore fit to be designated by a mind that apprehends them. It is much more difficult to actually realize emptiness of appearances, though. Practicing the true mantra enables a practitioner to realize that an independently existing self is not established through its own right or of its own accord and therefore does not really exist, the connotation of the term ‘emptiness.’ Furthermore, true mantra enables a fervent disciple to experience that - due to emptiness (i.e., lack of impediments for spatial existents to arise when conditions prevail) - it is not the case that nothing is present when appearances do arise and things happen. So, realizing the true mantra means experiencing the presence of clarity and radiant precision, i.e., realizing that the mind and all things are not only empty of inherent existence but are clear and radiant when they arise, abide, and cease. Realization engenders and increases one’s confidence in and certainty of the fact that things are not only empty of self-existence but are also clear and distinct when they arise - truly experienced when the secret mantra of cutting through has been accomplished. In daily practice, chöd means surrendering one’s body. Once in a while practitioners organize a big party and celebrate a feast, called chöd-ganachakra in Sanskrit. What is the fundamental, day-to-day practice of giving away one’s body? Machig Labdron - who learned, perfected, and delineated the practice of chöd that was imparted to her by great Indian Mahasiddas - taught the preliminary practices, the main practices, and the concluding practices. There are five preliminary practices: (1) opening one’s heart for all living beings by giving rise to bodhicitta, (2) taking refuge in the Three Jewels, (3) accumulating and increasing merit and wisdom, (4) dispelling negative mental habits, and (5) giving offerings as an expression of gratitude and joy. It is so much easier giving things to those persons one loves and likes than giving things to those persons one cannot stand, or giving things to those who have already harmed or who wish to harm one. But in the practice of chöd, one firstly thinks of worst enemies who are really out to hurt and harm. They are the most important individuals who need to be appeased through generosity. Secondly, maybe there are no tangible enemies who wish to hurt one; maybe there is nobody around who insults, belittles, or disparages one. Sometimes someone just gets in the way, or sometimes difficulties at work rule the day, or sometimes financial worries, sorrow, or anguish bring on disturbing situations in life. Then one can imagine that similar situations are spirits. Now, we do not really know if this is true, but it can be imagined - one can imagine that misfortunes have an intangible form and make good use of the opportunity to practice chöd. So, one can imagine the second type of recipients of generosity in the form of evil spirits. Thirdly, obstacles can also be objects of generosity, and there are many, e.g., being stopped from carrying out a plan, or having been robbed, or experiencing a streak of bad luck. One can imagine that such circumstances are intangible beings and wish to do something good for them. Sometimes there is tremendous fear of disaster or slight fear that something may go wrong. One can imagine such instances as formless living beings and not be afraid, rather use the opportunity to practice chöd by wishing and trying to do something really good for them. It’s necessary to not only understand but to face the truth that life entails suffering and pain. It is a fact that having been born means being subject to impermanence, ageing, sickness, and death. By acknowledging and accepting any painful and disturbing experiences that life inevitably entails, one can accept whatever happens and more easily recognize that nothing is really bad. If people are not nice, one can call to mind the aspiration prayers that one once made to help all living beings without exception. One is free to reflect that all living beings, whoever they are, were once one’s kind parents one promised to help. During the practice of chöd, one especially remembers most horrific enemies and foes or thinks about the most malevolent spirits and greatest obstacles that can be imagined. This is one of the seven points of lojong practice, namely using obstacles and hindrances as the path, by not getting angry about what is usually considered terrible but by being grateful and making good use of the exceptional chance to generate and increase loving kindness and compassion instead. Lojong teaches that every living being - especially those out to harm one as well as frightful spirits who seem to just show up - was once one’s dear mother. A practitioner of lojong contemplates, “I want to transform them into the state of the Great Mother.” What does this mean? Great Mother is a synonym for Prajnaparamita, ‘perfection of highest wisdom-awareness’ that extraordinary individuals who have reached supreme bodhisattva levels have realized and one wishes to realize too. How is this supreme goal accomplished? Through the virtue of listening to and contemplating the Dharma, in order to gain certainty, and through the virtue of meditating the instructions, in order to actually realize yeshe (‘primordial wisdom’) that all Buddhas have. Prajnaparamita (Sher-phyin-ma, ‘Perfection of Wisdom’) is called “Great Mother” because she gives birth to four types of aryas (‘noble beings’). Buddha-aryas would never have become a buddha (‘a fully realized saint and sage’) without first having been born by Prajnaparamita. She also gives birth to bodhisattvas, to pratyekabuddhas, and to shravakas, i.e., to all maha-arhats who have reached the goal they diligently worked on to reach. The four accomplishments that the four types of aryas accomplish could never be achieved without prajna. Therefore Prajnaparamita is compared to a mother, a great mother. Having decided to lead all living beings to the same state as Prajnaparamita, one needs to be honest and admit that one is presently not in a position to do so. Why? Because one is still overwhelmed by delusions and emotions that follow. Everyone has the potential and ability to become free from delusions concerning the way things are and the way things appear. Everyone has the capability to become free of deceptive illusions and, having accomplished the goal, to lead others to the same state. We have heard these instructions many times and know that usually the first contemplation and meditation in any sadhana (a vajrayana liturgy for one of many deities that includes chanting, visualization, and mantra recitation) is taking refuge in the Buddha, Dharma, and sangha, and that the second practice is giving rise to bodhicitta. We may wonder, “Why is the order of practice different in chöd?” The reason is that chöd is a special practice. Its purpose is to enable practitioners to pacify and overcome emotions, especially the strongest emotions that disturb and harm most painfully (pride, anger that is born from hatred, passion, ignorance, and jealousy) as well as those feelings that are not listed as the most harmful emotions but that arise due to attachment to a self (such as fear, depression, etc.). Therefore it is necessary to open one’s heart to others every time one engages in the practice of chöd by first generating bodhicitta. The second preliminary practice is seeking refuge in those who are competent and reliable. In the Mahamudra-Ngöndro practice, one thinks that, together with all dear friends and family members, one seeks refuge in the images depicted in the Refuge Tree. In the practice of chöd, though, one invites all those one thinks are malicious enemies. One imagines that one sincerely invites all enemies by first blowing a thighbone trumpet (kang-gling in Tibetan). This may sound strange, repulsive, and frightening. Why is the trumpet used in the practice of chöd a thighbone? Nothing in dharmadhatu (‘the vast expanse of space’) is really awful and dreadful; nothing is dirty or clean, because those interpretations are not real. The thighbone trumpet symbolizes this fact. Jetsun Milarepa taught, “Everything in dharmadhatu is one-taste.” He explained why the kang-gling is used and said, “The sight of a corpse disgusts us, but it is not different than the physical body we carry around with us anyway and cherish so much. Therefore, there is no reason to be repelled by a kang-gling.” So, that is why it is used. Calling those persons, spirits, ghosts, and ghouls that one thinks are repulsive and cruel in one’s imagination causes various reactions in them. Some of them may wonder why they are being addressed and become suspicious or disturbed, scratching their heads, puzzled, and wondering whether one’s intentions are good or not. This is normal. If someone we don’t like calls us by our name, for example, and tells us to hurry on over, we too would wonder what they could possibly want from us. Therefore one claps the trumpet three times and tells them, “Do not be afraid. Please, listen to me.” One continues by asking them, “Come on over. I wish to do something good for you, so do hurry.” One calls all negative forces one can imagine when one forwards the invitation that they please come on over to take refuge together. When guests are invited to participate in other practices and have arrived, one usually imagines that everyone takes refuge in all teachers of the transmission lineage and that all Buddhas, the Dharma and the complete sangha are assembled in the Refuge Tree in front. In the practice of chöd, though, one imagines that Prajnaparamita is seated in the centre of space in front. She has gone to the other shore, the shore of primordial wisdom that is beyond form. During the practice of chöd, one imagines that she has a form and can protect everyone from falling from low to lower states of existence and, as a result, suffer horrific wounds and laceration. She is Yum-chen-mo, the ‘Great Mother’ of the wisdom that gave and continues giving birth to Buddhas, bodhisattvas, pratyekabuddhas, and shravakas, those saints and sages who manifest invaluable qualities by having realized wisdom-awareness. This is why she is more than a friend - she is a protector, a source of refuge. This is why she has a golden body, because gold is very valuable and does not change. She is not only the embodiment of supreme wisdom but also actively helps everyone - and she does have a lot to do. Imagining her in a physical form, she can certainly help many beings with two arms and hands, but she can do much more with four. This is why she has four arms and hands. Each of Prajnaparamita’s four hands makes a distinct and meaningful gesture. Her first left hand is placed in her lap to show that she has reached the goal and transcended worldly knowledge with prajna. Three kinds of wisdom-awareness can be attained: (1) prajna that arises from hearing the precious Dharma instructions, (2) prajna that is developed by contemplating and reflecting the instructions one has heard, and (3) prajna that becomes manifest by meditating and integrating the teachings in one’s life. The final result of having accomplished the third kind of prajna is attainment of perfect mental stability, the goal, and this is why her left hand rests in her lap. The Sambhogakaya-Buddha is seated above Prajnaparamita in space in front. There are two types of physical emanations of a Buddha in the world of appearances: nirmanakaya and sambhogakaya. Buddha Shakyamuni is a nirmanakaya, wears three robes which denote simplicity, i.e., freedom from discursiveness. The Sambhogakaya-Buddha is depicted with many ornaments, which symbolize the radiance and abundance of insight and wisdom that bring joy and well-being. Both form kayas, each in its own way, show that perfect awakening is not a thing of naught, rather perfect awakening means being fully adorned and magnificently present while abiding in simplicity, sprös-bräl. Of course, the source of refuge is the Three Jewels, i.e., the Buddha, the Dharma and the sangha, the sangha referring to all great masters, protectors, and helpers who belong to the transmission lineage. So, just as in lojong practice, together with all guests, one invokes the Buddha as the ultimate teacher who shows the way. Then one invokes the Dharma that is the teachings. One also invokes the sangha, those beings that protect, help, and care for everyone most heedfully. The Three Jewels are the source of freedom from suffering and fear, the reason one invokes them. Actually, the Three Jewels represent the wisdom and compassion that everyone will realize too - if they practice. The third kaya a Buddha realizes is the dharmakaya, which is the own mind. One needs to realize that the dharmakaya, one’s own mind, is unborn, empty of inherent existence, never arises or ceases. How can this be? One can investigate by taking an opponent’s view into account and ask, “If the mind is a solid thing that can be found and identified, then how can it be changed or develop for the better? How can one even hope to attain and manifest qualities of awakening if the mind is a solid and static thing?” In truth, the own mind is dharmakaya, unborn and empty of inherent existence. This is the situation. At this point in practice, one is assembled with one’s worst enemies, with all those one thinks are out to harm. One seeks refuge together with them. Everyone who has arrived shows deepest respect for all sources of protection, for the yidams and protectors at the base of the Refuge Tree, too, by folding their palms and speaking The Refuge Prayer with devotion and an open, loving heart. While concentrating on the source of refuge, i.e., all Buddhas and bodhisattvas who possess magnificent qualities, and while concentrating on Prajnaparamita, one prays, “May the body of all living beings, including myself, be well and all our actions help others. May everything we say be beneficial and good. May our minds be pure and sincere.” One recites this because one wishes that all living beings have happiness and the causes of happiness. The causes of happiness are wholesome deeds carried out with one’s body, helpful and encouraging words that one speaks, and pure thoughts and intentions generated and held in one’s mind. The practice of seeking refuge together with one’s enemies and foes is concluded by praying that all living beings be naturally free of painful experiences, that they may be happy and content, and that they fully realize the qualities that all those noble beings assembled in the Refuge Tree have. And so, in the practice of chöd, generating bodhicitta is the first preliminary practice and taking refuge is the second. Generating bodhicitta means opening one’s heart for others, the reason it is the first preliminary practice. Following, one takes the bodhisattva vows to always work for the welfare of others; it is the second aspect of increasing bodhicitta. The community of practitioners who took refuge have opened their hearts for others by giving rise to bodhicitta, but it is important to make the same promise and pledge that bodhisattvas always made and make, by saying, “Now we will really work for the welfare of others and promise never to forfeit our commitment.” This is a special practice that consists of five steps: (1) admitting and regretting all bad actions one and all others formerly carried out with body, speech, and mind, (2) being happy about the good one and all others have been able to do, (3) seeking refuge in the true objects of refuge together with one’s guests, (4) conscientiously resolving to help all beings by taking the bodhisattva vows, and (5) making wishing prayers and dedicating any positive merit that has been able to accomplish for the welfare of others. This is the stage in practice at which one conscientiously resolves and promises the Buddhas of the three times to work for the welfare of others, just as they have done and continue doing. The Buddhas of the three times are those who have worked and those who continue working for the benefit of others. One speaks the aspiration prayer together with all those one invited and resolves, “Just as the Buddhas of the three times have worked for the welfare of others, we wish to do this too.” One intensifies the prayer by promising to carry out one’s intention so that it is fruitful and effective by praying, “May this aspiration not only be an idea, but may all our wishes come true.” These two aspects are bodhicitta of aspiration and bodhicitta of application. As it is, one makes offerings to a referential object during sadhana practice in order to accumulate merit, and the recipient of offerings in the practice of chöd is Machig Labdron, who is imagined to be in space before one. She embodies all saintly beings, protectors, and dakinis who are assembled in the Refuge Tree. She is also inseparably one with our Root Lama. Historically, Machig Labdron was a mahasiddha (‘a great pandit and saint’) who lived in Tibet and attained realization. In the practice of chöd, one sees her as a wisdom dakini. Dakinis are female spiritual beings that fulfil enlightened activities, which protect and serve the Dharma as well as all practitioners. They are actually the root of activities among the Three Roots. The Three Roots (rtsa-ba-gsum) are the Lama, yidams and dakinis. The Lama is the root of blessings, the yidam meditation deities are the root of all siddhis (‘accomplishments’), and the dakinis are the source of Buddha activities. Machig Labdron is white in colour, has one face and three eyes. The third wisdom-eye on her forehead symbolizes her unclouded vision that sees everything. In her left hand, she holds an upturned bell at her hip; her right hand is upraised and holds a damaru (‘hand drum’). One imagines that she is naked. Even though the mind’s true nature is always and already present as naked awareness, one does not see it, because illusions and emotions overwhelm and distract the mind powerfully. Mind’s true nature is inconceivable - it is the indivisibility of emptiness and luminous clarity. One can only experience the true nature of one’s mind after having vanquished all preconceptions and emotions, symbolized by the tiara of five skulls that she wears. Being naked means that she has vanquished harmful emotions. Not only has she realized pure consciousness, i.e., naked, primordial wisdom, but she also possesses all qualities of mind’s true nature. Therefore, she is adorned with gold earrings, necklaces, bracelets, and anklets; they symbolize mind’s abundant and radiant qualities of clarity and primordial awareness that actively abound for the welfare of others. Realizing the true nature of all things that appear, abide, and cease again through wisdom-awareness frees from having to experience unremitting suffering and pain - samsara. Realizing the true nature by engaging in compassionate activities frees from abiding in one-sided bliss - nirvana. Machig Labdron is therefore in a dancing posture; her legs symbolize these two aspects. When one realizes the true nature of everything, then one is not subject to suffering and pain but is truly free of the torments that samsara entails, symbolized by Machig Labdron’s bent left leg. Not turning one’s back on and not being indifferent towards those trapped in the endless cycle of craving and frustration, by abiding in the bliss of peace, is symbolized by her outstretched right leg. Her dancing posture is an expression for her joy of having realized reality through prajna and for her delight in working for others with loving kindness and compassion. She is also happy because she is surrounded by the teachers and deities of the field of accumulation of merit and wisdom, i.e., all saints and sages of the transmission lineage, who are one with our Root Lama. Padampa Sangye (d. approx. 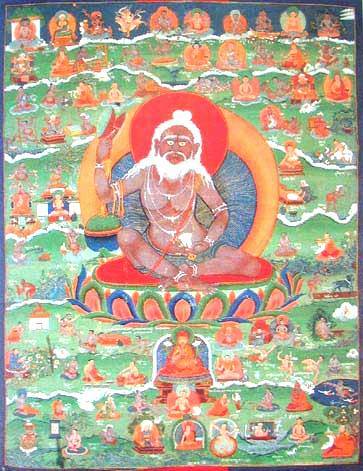 1117 A.D.), father of the transmission lineage of chöd, was the great Indian siddha who, it is recorded, came to Tibet five times and introduced the lineage of zhi-byed (‘pacification’ of suffering). Chöd is a branch-teaching of zhi-byed. He and all masters of the transmission lineage of the skilful means of chöd are seated atop a cloud bank slightly above Machig Labdron’s right side. The king, a witness, Kamalashila, and Hwa Shang Mahayana were sitting together, and the king placed one garland of flowers in the hands of Kamalashila and another in the hands of Hwa Shang Mahayana. The king then said, “Two systems of Dharma have arisen; the Dharma of sudden realization and the Dharma of gradual realization. Because of that, people have become confused about how to practice Dharma. To clarify this confusion, please debate. When you have debated, the loser should, without pride, offer his garland of flowers to the victor. Whoever loses should leave Tibet and return to his own country.” Then they debated. Kamalashila asked questions and defeated Hwa Shang Mahayana. Having lost, Hwa Shang Mahayana offered his garland of flowers to Kamalashila and returned to China. After the debate, King Trisong Detsen asked Kamalashila to compose a text explaining the stages of meditation from the Indian Buddhist tradition and said, “You have seen the trouble that arose here. In order that the teachings of the Buddha not be distorted similarly in the future, please compose a reliable treatise that is easy to understand and of great benefit.” To guide the new Tibetan monks who were studying at Samye Monastery, Kamalashila composed a text in three volumes, called Stages of Meditation - Bhavanakrama in Sanskrit, sGom-rim in Tibetan. Now, Kamalashila was not only brilliant, but it is said that he was also very handsome. Some scholars refute that Kamalashila returned to Tibet, and there is a basis for their doubt. When Kamalashila left Tibet, he went to India. There is a story that on his way to India, he came across the corpse of an Indian man who had died of a terrible disease. Because the illness was contagious, no one dared come near the corpse. Kamalashila wanted to help the people of the area. His consciousness moved to the corpse, walked it to a distant place, and dumped it there. Then his consciousness came back to the place where he had left his own body. However, Padampa Sangye, who had a very ugly body, came across Kamalashila’s body, which was not only handsome but also free from any illness. He thought: “This body of mine is not good. That fresh corpse is good and handsome. I would like my consciousness to move to that body.” His consciousness then moved into the body of Kamalashila, and he walked off, leaving his own body behind. When Kamalashila’s consciousness returned, the only body around was the ugly corpse of the Indian yogi, into which the consciousness of Kamalashila entered. Thus, the mind was Kamalashila’s but the body was not - and vice versa, the mind was Padampa Sangye’s but the body was not. And so, that’s why it is recounted that Kamalashila came to Tibet a second time, in the body of Padampa Sangye, the yogi seated to the right of Machig Labdron. He holds a thighbone trumpet in his left hand and a damaru in his right hand. He disseminated the methods of chöd in that body. The practice of Prajnaparamita belongs to the practice of chöd, which is why the paternal lineage of method is seated at her right side. Vajravarahi, who embodies five forms, stands at Machig Labdron’s left side. Vajravarahi is the consort of Chakrasamvara, a deity belonging to the Anuttaratantra or highest tantra. Vajravarahi is the sambhogakaya emanation of Prajnaparamita and is one of the main yidam practices in the Kagyu Tradition. Four refuges that enable practitioners to develop and increase loving kindness and compassion are invoked in order to develop and increase one’s accumulation of merit and wisdom: (1) the transmission lineage seen above Machig Labdron, (2) the protectors situated below her, (3) all enemies one is indebted to, and (4) all friends. The supreme teacher, Buddha Shakyamuni and all saints and sages who belong to the lineage of chöd are assembled around Machig Labdron. They are all great bodhisattvas who were present when Lord Buddha manifested the Second Dharmachakra, and therefore they belong to the pure transmission lineage of non-dual reality. Machig Labdron was also present on that occasion. Above Buddha Shakyamuni is the emanation of Prajnaparamita, her body golden in colour. Machig Labdron is indivisibly united with all teachers seated at her right side and all yidam deities of Prajnaparamita at her left side. The third preliminary practice is concluded with the words VAJRA SAMAYA DZA, the Sanskrit phrase that denotes samaya (‘promise and pledge’). This short mantra reminds the deities in front to please remember their commitment and not leave. Then one blows the trumpet and speaks the mantra of the four immeasurables, DZA HUM BAM HO. The first syllable DZA means ‘all-encompassing love for all living-beings,’ HUM means ‘compassion,’ BAM means ‘joy,’ and HO signifies ‘impartiality or equality of all living beings.’ Every image in the visualization can certainly help a practitioner increase wholesome and beneficial qualities. Then one recites The Seven-branch Prayer. The seven branches in chöd are: (1) respectfully bowing to the devotional objects of refuge, (2) taking refuge, (3) acknowledging and confessing evil acts done in the past, (4) requesting the Dharma teachings, (5) asking all awakened Buddhas and teachers to remain in the world, (6) dedicating any good every living being has been able to accomplish for the benefit of others, and (7) reciting wishing prayers that everyone attains perfect realization of emptiness. At which point does one rejoice in the good everyone has been able to do? When seeking refuge. Let us use the opportunity and practice together now. When one has completed the main practice of chöd, one has offered a truly precious present to all objects of refuge as well as to all those who are destitute and in need. The positive impression of having offered one’s most precious possession, one’s body, should not be thought to have been carried out for oneself, rather it is necessary to see such a generous act as a contribution so that all living beings attain perfect awakening. When Buddhas appeared in the world and turned the Wheel of Dharma in the past, many of those who were present on those most exceptional occasions attained perfect awakening. In everyday practice now, one thinks of those beings that have not yet realized the ultimate goal. This is one’s ultimate wish, that one truly contributes to the awakening of all living beings who are still trapped in the suffering and torment that samsara entails. Not leaving it at that, one prays that through one’s generosity all living beings may have all luxuries, just as plentiful as all treasures that can ever be found in the entire universe. Treasures in the entire universe are all luxuries and riches that abound in the myriad worlds throughout the inconceivably vast expanse of space. Not leaving it at that, many individuals who have not received as much as others may react with jealousy or avarice. Therefore, one dedicates any good one was able to accomplish so that everyone is content, so that no one has the feeling that they are losing control over their own lives by accepting presents from others, nor that they become angry or feel belittled as a result. One prays that nobody argues or fights but experiences joy and happiness on account of one’s generosity. This concludes the aspect of wishing. Now we will look at the aspect of making wishing prayers. First, a practitioner imagined having offered his or her own body sincerely and delighted all those assembled in the Refuge Tree. He or she made all those beings in need and deserving of loving kindness and compassion very happy. He or she appeased enemies and foes, those beings who are filled with hate and rage, by not retaliating but by spoiling them generously. That is good. The next wishing prayer one makes is that all living beings dedicate their lives to achieving calm abiding and insight that is established through practicing the path. One also prays that nobody ever looks down upon himself or herself. Every once in a while frustration and doubt overcome everyone and thoughts such as, “Am I an idiot! Am I a fool!” arise in one’s mind. One prays that practitioners cut all doubts and hesitations related to their body and speech and, instead, acknowledge and appreciate that they have attained the eight freedoms and ten endowments. The eight freedoms are: not having been born in one of the three lower realms, not having been born a barbarian, not having been born a long-life god, not holding wrong views, not being born when a Buddha has not appeared, and being mute. The ten endowments are: having been born a human, in a central country, with all senses intact, not reverting to evil deeds, having devotion for the teachings, a Buddha has appeared in the world, a Buddha taught the precious Dharma, the Dharma that was taught continues, there are followers, there is love and kind support from others. That is the physical aspect. The mental aspect is acknowledging and respecting that everyone is endowed with the Buddha nature and has the ability to lead all living beings to ultimate realization. In truth, we are all very fortunate to live where we do. One hundred years ago, nobody in this country even knew that the Dharma existed, and therefore nobody received instructions on how to practice chöd, phowa, or yidam meditation. Now the teachings are spreading and are being practiced. We are very lucky, because we were born at exactly the right time and in the right place. Therefore we can be very happy and wish that others are just as fortunate. Furthermore, the chöd text warns with a prayer that reads, “May we never become arrogant or proud about good qualities that we may have.” This means to say that one should never think one is better than others or has more, a danger that can arise in the mind of a practitioner. Such thoughts are obstacles. Much good has been accomplished, but things can go wrong. Then a practitioner should never feel discouraged or belittle himself or herself by thinking, “I ruined everything!” or “Things went wrong!” or “I missed a chance!” It is important to realize that things do go wrong, but it is necessary to remember that everything changes and passes and not to hold on to problems by feeling sorry for oneself. The section on making wishing prayers concludes with the prayer that evil be cut away at the root and that the authentic Dharma - that frees from suffering and never misleads anyone – flourishes and spreads like the sun that illuminates every corner of the world. The text then closes this section of practice with the prayer, “May all living beings be happy and content.” In order to eliminate doubts, let us meditate together now. As it is, one continuously thinks, “I, me, myself, and mine,” because one believes that a self truly exists and clings to it as though it were independent. As a result, painful emotions (like anger, pride, greed, jealously, miserliness) arise and overwhelm one, bringing on many problems. Nobody is happy when problems arise; nobody wishes to be a victim of harmful emotions. But emotions do not disappear through wishful thinking. The Buddha spoke about the source of negative emotions and taught that they arise because one believes in a self and continuously clings to this thought. He explained why clinging to a self is the root of suffering and pain that disturbing emotions always bring on. He showed that when the erroneous belief in a truly existing self is overcome, then emotions cease. Wishfully thinking that one can eliminate the mistaken belief in a self does not work, though. Those who are lucky can take it upon themselves to investigate thoughts, such as “I am” or “I am acting.” By doing so, they discover that such concepts are based upon clinging to a self, and that clinging to a self is merely based upon the belief that a self exists of its own accord. By investigating carefully, one discovers that thoughts regarding a self are wrong. Noticing and actually seeing this error dispels it. Where does the self that one thinks truly exists and clings to so strongly exist? Everyone’s life consists of a body, speech, and mind. Searching for the self with linguistic skills shows that words are impermanent - they cease the moment they are spoken. So it is conclusive that speech is not an inherently existing thing nor that an independently existing self can be found in the faculty of speech. Let us therefore investigate whether the self is inside or is the body. Many people believe that the body is the self or that the self resides in the body and live their lives based upon such assumptions. How can the body be an independent self? It is comprised of so many parts. Should the body be the self, how many selves would an individual have? For example, one may wonder whether the eyes, or ears, or nose, or other components that describe what is called “a head” are the actual “a head.” This example applies to the organs, limbs, and other parts of the body, too. Every part of the body consists of many smaller parts and cells, so which part of the body would be the self if the self is the body? Chariots were a means of transportation during the times of Buddha Shakyamuni, therefore it was used to exemplify that a self does not exist as assumed. Questions were posed, “Is the carriage the chariot? Is the axis the chariot? Are the wheels the chariot?” and so forth. Seven parts of the chariot were checked to find where the chariot actually is located. Lord Buddha showed that the body, like the chariot, is not fit to be called an independently existing thing, and therefore it is conclusive that the body is not the self nor that an independently existing self can be found in the body. So, let us look at the mind. The idea that an independent self exists collapses upon having investigated whether it can be found in one’s body, speech, or mind. When a practitioner is aware of the absence of a truly existing self, clinging to a self ceases and harmful emotions collapse. During the practice of chöd, one practices phowa, generously offers one’s body and makes wishing prayers. The commentaries on the practice say that an advanced practitioner never leaves the middle by moving away from inner stability of calm abiding nor does he or she cling to thoughts that are imagined during practice. Chöd-ganachakra, the fifth and last practice carried out in the main section of chöd, is celebrating a great feast offering. Three offering are made, by mixing together three presents into one. What is called “the three mixings” are: (1) mixing one’s own mind with that of all other living beings, especially with the minds of demons, enemies, and foes, (2) in order to purify mind, mixing all minds that have become united with dharmadhatu, and (3) mixing any leftovers from one’s chöd offering with the imagined and invaluable ingredients of the ganachakra offering. There are three types of ganachakra offerings: (1) outer ganachakra refers to all external appearances that exist in the world and do not belong to oneself, like mountains, streams, meadows, and beautiful clouds. (2) Inner ganachakra is all personal possessions, all merit and luxuries one has collected in the past. (3) Secret ganachakra is any realizations and experiences one has attained through practicing the generation and completion phases of yidam meditation, Mahamudra, Dzogchen. The first paramita of generosity is a very decisive factor in the practice of bodhisattvas. One can give to those more fortunate as well as to those less fortunate than oneself. In Vajrayana, we learn that material offerings do not make the Buddhas and lineage masters happy, rather the most precious present one can give to the Buddhas and lineage masters is realizing the true nature of one’s own mind. Imagining all treasures of the universe in the form of a mandala is an extraordinary present, because a practitioner is free of being stingy or competitive while correctly arranging the mandala. In the practice of chöd, surrendering one’s own body is understood to be most difficult but also most beneficial, therefore this practice is only imagined. Imagining one’s body arranged on a mandala and offering it in chöd is an exceptional way of being generous. The purpose of Vajrayana practice is to become free of four faults. They are the fault of thinking or believing one is godly or special, the fault of disturbing emotions, the fault of fearing death and the fault of believing that all or a few of the five skandhas are the self. The five skandhas are the five aspects which comprise the physical and mental constituents of a sentient being: physical forms, sensations, conceptions, formations, and consciousnesses. The four faults are described a little differently in chöd. The chöd instructions say that (1) the first fault is thoughts, for example thinking, “This is red, and that is white,” “There are mountains over here and lakes over there,” “This is beautiful, that isn’t.” Having thoughts that are a fault refers to personal judgements. Thinking that one thing is good subtly implies thinking other things are bad. Attachment to what one thinks is good and aversion against what one thinks is bad are born due to thoughts. If they aren’t cut, thinking that apprehensions are real and being influenced by one’s personal discursiveness as a result lead to greater and greater obstacles. During meditation practice, awareness needs to be precise. One needs to detect slightest movements of the mind. What does one do when one notices that attachment (that eventually turns into passion and greed) arises? One does not follow the thought, leaves it alone and simply sees that it disappears into the vast expanse of space. (2) The second fault is being without thoughts. All thoughts of greed, jealousy, pride, etc. are based upon thinking things are real. When thoughts that are conceived due to believing that things are real cease, joy can arise in the mind of a practitioner. After a short while, this joy ceases, and fright and doubt suddenly spring up in the mind. Similar feelings are not emotions. They are non-referential and therefore called “absence of thoughts.” Being without thoughts is a feeling that has no reference. What does one do when this happens? One needs to notice the sensation, cut it with PETH, and remain in pure awareness. (3) The third fault is being joyous, which also arises because one clings to a self. While practicing, one can feel very happy that things are going so well. One can even be happy that signs of accomplishment have become evident, or that one is progressing along the path, or that one is really good. Such joy about one’s progress becomes a problem if one clings to it. Progress is obstructed by such arrogance, which stops wholesome qualities from increasing. Joy happens naturally and is not bad, but it becomes a fault if one clings to it. What should one do when this happens? One recognizes the error, says PETH, and rests without a thought and without a reference. (4) The fourth fault is being stubborn, which is also based upon the mistaken belief in a self. Even though one may know that there is no self, one often stubbornly insists that there is, for example by thinking, “I have to do something good” or “I should not be bad.” The idea of a self is present in such thoughts. Although these thoughts are not wrong but can lead to good results, they become a fault if one is influenced by the idea of a self and acts as though it were true - that creates problems. Therefore being stubborn is a fault that needs to be cut off. How does one do this? By recognizing that the idea of a self arose, saying PETH, and letting it go all on its own. People are free to engage in two kinds of activities: beneficial or harmful. One can harm others, either by hurting them directly or by putting obstacles in their way. Harmful activities are senseless, beneficial activities aren’t, because they are born from the wish to help others. Therefore, generating and keeping good wishes in one’s mind is very good – the more, the better. Even if one’s wishes are small, one’s own life as well as that of others will be better. Of course, it is natural to mainly wish those persons one likes most the best. In contrast to such limited wishes, the greater aspiration of a Mahayana practitioner is to wish that all living beings without exception (no matter who and where they are) equally realize prajna, experience lasting happiness, and become free from suffering. Another aspect of bodhicitta is actually putting one’s wish to help everyone into practice by engaging in bodhicitta of application. One sees what others need and helps by giving them food, clothes, shelter, and daily necessities. This is the aspect of compassion. Is that helpful in the long run? Someone with a good heart sees that generosity helps and is certainly effective, but a bodhisattva who has wisdom-awareness knows that offering reliable means so that everyone is able to become free from suffering and experience lasting happiness is better. This is the aspect of wisdom. A person who takes the bodhisattva vows wishes to practice both aspects of bodhicitta, that of aspiration and that of application. There are three steps involved when taking the bodhisattva vows: the preliminary ceremony, the main section, and the concluding practice. The preliminary ceremony is taking refuge in the Three Jewels. One may think one has already done this and wonder why one does it again. The general practice of seeking refuge in the Three Jewels pertains to this life, whereas taking refuge in the Three Jewels within the context of the bodhisattva vows means taking refuge until one has attained perfect awakening. So, (1) one first seeks refuge in the Three Jewels for as long as samsara persists. (2) One then resolves to practice just like the Buddhas and bodhisattvas did in the past. And (3) one rejoices that one has taken the vows. Shantideva wrote in the Bodhicharyavatara that the resolution to achieve awakening brings great joy to oneself. Why? Joy encourages - regret discourages. Having taken the vows, one realizes that it was a very good thing to do and a wonderful moment in life. Having planted the seed, one appreciates that one’s life has become meaningful and that one is a member of the Buddha family. One is certain that one will attain perfect awakening and therefore one is very happy. Many people waste their lives away. During the official ceremony, one imagines inviting all those who are helpless, lost, freezing and starving, without a protector and a purpose in life. One asks them to rejoice in the fact that they will receive help, that they will become free from suffering, and will have the opportunity to lead a meaningful life. The concluding practice of taking the bodhisattva vows consists of three steps: (1) appreciating that bodhicitta is exceptional, because it is the foundation and ground of full awakening. Why are so many beings trapped in samsara and experience suffering as a result? They have not aroused bodhicitta. Therefore one prays that everyone generates bodhicitta and understands that they can become free of misery and woe. (2) Many have opened their hearts but forget, in which case they cannot become free from suffering. One prays that bodhicitta that has arisen in their mind remains and does not get lost. (3) here are many people who have made the commitment and hold bodhicitta in their minds, but they do not increase it. One prays that they progress in their practice. The precious Dharma was brought to Tibet and is spreading to all corners of the world now. Everything that happened then and is continuing to happen today is a manifestation of his Buddha activity. Where does Buddha activity come from? Buddha Shakyamuni appeared in the world, attained realization and shared his insight with others. When did his amazing Buddha activity begin? In a Sutra it is said that a long time ago a poverty-stricken beggar was born as a Brahmin. He only owned a begging bowl. When he met the former Buddha of this aeon, he offered what was inside his bowl with deep devotion. The Buddha accepted the present. In that moment, the Brahmin had the wish and made the prayer tobecome just like the Buddha he met. It was a simple wish, a wish that grew and grew and came true. Today we experience the resolution that the Brahmin once made. We have given rise to the same aspiration, and the effect will be just as wonderful and immense. What are the actual instructions on abstaining from evil and on doing good? Sometimes positive thoughts govern the mind, sometimes bad thoughts. Learning to control the mind is crucial in stopping the mind from alternating between bad and good actions. One needs to know that the mind is ruled by the belief in a self, the primary cause of bad deeds. And so the sadhana presents a summary that reads, “Do not do anything harmful. Do good and tame the mind.” The text addresses those who hurt others, not those who don’t. The closing instructions on chöd deal with taking Dharma onto the path. One imagines being Arya Chenresig, white in colour and with four arms. Why? He embodies compassion of all Buddhas. One wishes to help all guests one invited, therefore one imagines oneself as Chenresig. Light shines from one’s heart and transforms all male guests into Noble Chenresig and all female guests into Arya Tara. Following, everyone sings the six-syllable mantra together. One imagines that everyone is happy and returns home again. If someone who seems to be obsessed or haunted by demons asks a practitioner to perform a chöd ceremony for them, inviting such persons as guests during the practice is not in vain. Maybe we will be in a similar situation some day and need to ask a Lama or practitioner to please perform this practice for us. Westerners who travel to India meet persons who look like crazy yogis, playing a damaru and blowing a thighbone trumpet while wandering from one corner of the country to the next. Certainly, there are charlatans everywhere, even in India, but that is not the point. Since one cannot judge, one can simply be generous towards them or appreciate their generosity. The point is watching one’s own mind, taking advantage of the opportunity to rest in calm abiding and to practice equanimity, instead of being judgemental. Sometimes one doesn’t want to go to the trouble of engaging in all the details of the practice, yet one wants to practice chöd. There are simple practices, such as abiding in loving kindness and compassion, transferring one’s consciousness once in a while, and abiding in loving kindness and compassion again afterwards. This is phowa with characteristics and without a reference, in which case consciousness, awareness, and the vast expanse of space become one. Then one rests in loving kindness and compassion again. But sometimes this can also seem too tedious. In that case, one can do the extremely short practice of resting the mind in dharmata (chos-nyid in Tibetan, ‘suchness’), which refers to emptiness and means that the true nature of every appearance and experience in dharmadhatu (‘the vast expanse’) always remains as such. Disciples who practice chöd in the West certainly wish to appease all enemies but often disturb their neighbours while trying, who become madder and madder the more one plays the instruments. In those less fortunate surroundings, one engages in the entire practice without using the drum, trumpet, and bell. Another unfortunate situation can arise, described in the story I want to tell. Once an unkempt chöd practitioner walked through India and found a right spot to practice. The wild-looking yogi saw a little boy who was crying and asked him, “What is the matter?” The little boy trembled at the sight of the longhaired yogi and wailed all the more. The yogi wanted to make the little boy happy by cracking a joke and teasingly said, “I’m going to eat you up.” Utterly terrified, the little boy ran home, screamed for his mother, who called the police. They found the man, searched through the dirty bag he had and found a skull cup. Yes, we need to be cautious. Actually, there are so many reasons to rejoice, especially about the fact that one received the Dharma teachings and can practice, which is very good. Lord Buddha taught that we need to tame the own mind. The practice of chöd enables us to become free of emotions and delusions, which means to tame the mind. This is why one practices Dharma, and it is very helpful. There are no rules and regulations that say one must be moderate and shy - one can practice Dharma as much as one wants. Anyone who is less proficient need not worry or feel badly. If university students flunk their exams, they are frustrated and feel that their studies were a waste. Dharma is different, because even the smallest practice is beneficial. We need to know this. 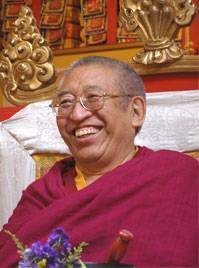 Thrangu Rinpoche: I did not talk about actually giving away one’s body, organs, or limbs while alive. In the Bodhicharyavatara, Noble Shantideva spoke about not giving away one’s bodily parts or organs while still alive and that such acts of generosity would cause much pain and regret to unenlightened beings. To clarify this statement, living dismembered, without a hand, for instance, is not really recommendable because handicapped people are usually not happy. So that would not really be good. Shantideva said that one should only be just as generous as the Buddha if and only if one is sure and certain that one will not regret it afterwards. Giving one’s organs away after one has died is really good because then one does realize that the body is of no use to oneself anyway. Offering one’s organs that one is not attached to anymore and does not need anyway will help somebody else, and therefore donating one’s organs after death does not contradict Shantideva’s statement. TR: That isn’t so bad. At this point in life, when leaving the body behind while dying, we are finished with it. If we are a little alive or a little dead, our expectations about this life are zero when we die. This is why donating one’s organs isn’t bad. A bardo being has clairvoyance and feels little or no attachment to the body left behind, especially if he or she decided to donate organs for the welfare of someone else after death. Seeing the person receive one’s organs, like someone who does need a new kidney in order to survive, is very beneficial and good. TR: Yes, that is right. On the other hand, realization of the own mind as the unborn dharmakaya is not something that just happens, rather it is a matter of becoming accustomed to the sources of refuge now - the Buddha, Dharma, and sangha. We diligently engage in practice in order to one day realize just this, the true protector and goal, which is discovering that the own mind is dharmakaya. You will achieve this. TR: Surely, that is right. The results of Mahamudra, Dzogchen, generation and completion phases of yidam practice are identical. Chöd is different in that one uses the strongest emotions, like hatred, anger, jealousy, fear, etc., by inviting those most negative emotions to take part - one even uses a thighbone trumpet when one earnestly invites them to appear in a physical form. This distinguishes the practices, but they are in truth not different and do lead to the same result. TR: OM belongs to all mantras and consists of three parts, A, O, and MA - awakened body, awakened speech, and awakened mind. TR: The main teacher is the one you are connected to the most. Secondly, the purpose of practicing chöd is to increase wisdom, so beginners do not need to invite controversial images. There is no need to worry. Thirdly, the practice of chöd offers a possibility to increase love and compassion, so demons are very important. They are situated below Machig Labdron and look at us. TR: It is possible to do phowa for others. There exists a practice called “phowa for the living,” in which the method of the transference of the consciousness to a Buddha field may be given as a blessing for the benefit of longevity in life. The practice of phowa that is carried out during chöd is done only for oneself. TR: Yes, if one can. The practice of cutting through is a wonderful method to directly realize the final result, which is primordial awareness. Then one is free of discursiveness that causes people to assume that apprehensions are real. Skilful methods are practiced in order to realize the true nature of apprehensions. We do employ various methods to increase and establish positive factors of the mind, making it easier to realize reality. If we want to realize the true nature of our mind, fighting and being stubborn will lead nowhere; avoiding those factors will not help either. Visualizing enemies is only dangerous if one is proud, jealous, angry, greedy – bigger dangers in life. In the practice of chöd, our aspiration to help others with love and compassion is so very pure and sincere. Therefore, nothing dangerous can ensue. TR: Looking at daily life, we too can think it is okay to only eating bread every day of the year, but vital nutrients that our body needs would be missing. Some people spice their food a lot, making their meals more tasty and delicious. So we include many ingredients in the offering practice of chöd. I want to tell you how happy I am that so many people are studying the Dharma, that so many people have come to receive teachings and want to practice chöd. I pray that your endeavours help many beings and are auspicious. Thank you. Your life is space’s vajra essence, permeating space. The locket of the sun and moon, unchanging, never leaving. With sincere gratitude to Thrangu Tashi Chöling e.V. for having sponsored this most auspicious event & for supporting Rinpoche’s many Himalayan children’s projects. Translated into English, edited & arranged by Gaby Hollmann, Munich 2006, in reliance on the German rendering by Christop Klonk. Copyright Thrangu Rinpoche, Thrangu Tashi Chöling & Kamalashila Institute in Germany. All rights reserved. 2009.